Networking via the biggest world-wide network (that's the Internet, to you and me), gets easier all the time. Of course, as it gets easier to make connections, it's more and more mind-blowing how many choices you actually have. To get you on the right track, here are a few resources. "Ning" is a pretty popular networking avenue. It helps to simplify your networking life, bringing you more and more to the people to whom you want to be connected. Ning serves as a platform to create or join a social network based on your passions. A huge Ning community for educators is The Educator's PLN: A Personal Learning Network for Educators. A Google search of "Ning.com" and "Environment" gives you a good 6+ million hits. 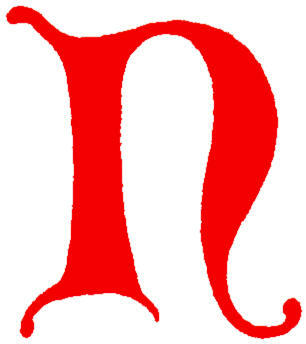 Letter N picture from http://www.fromoldbooks.org/Tymms-Illuminating/pages/43-letterN/. The Ning photo is the logo for the home Ning site, where you can create your own.